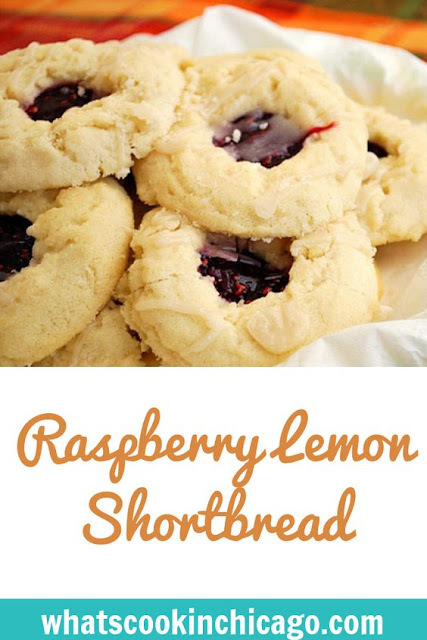 Article first published as Raspberry Lemon Shortbread on Blogcritics. Cookies are one of those things I make mainly during the holidays. But lately, I've been trying to bake cookies more throughout the year, especially when I have a gaggle of kids coming over to play every week. I recently had these Raspberry Lemon Shortbread sitting on my kitchen counter and they loved them! I guess I shouldn't be surprised. These cookies have a tender lemony crumb, a fruity raspberry filling and a simple sweet lemon drizzle... what's not to love?! Raspberry and lemon is a great combination, especially during the spring and summer. The sweet and tart flavors work so well together. When these cookies come out of the oven, they can be fragile. To ensure they hold their shape, be sure to cool completely. 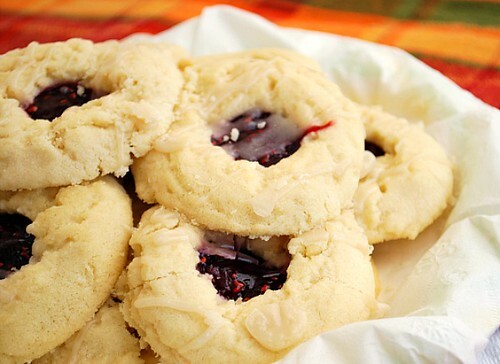 The recipe lends itself to other flavors of jam filling and you can even switch out the lemon extract for other extracts to pair up with the jam. I plan on making this recipe again with other extract/jam combinations! Preheat oven to 350 degrees F (175 degrees C). Line a cookie sheet or baking sheet with parchment paper; set aside. In a medium bowl, cream together butter and white sugar until smooth. Mix in the lemon extract. Mix in flour until dough comes together. Roll dough into small balls, about the size of a quarter and place on your prepared cookie sheets. Make a small hole in the center of each ball, using your thumb and finger, and fill the hole with preserves. Be careful not to add too much preserves - a little goes a long way! Place cookie sheet of filled cookies in freezer for 10 minutes before baking. Bake for 12-14 minutes in preheated oven, or until lightly browned. Let cool 1 minute on the cookie sheet. In a medium bowl, mix together the confectioners' sugar, 3/4 teaspoon lemon extract, and milk until smooth. Drizzle lightly over warm cookies. I'm in love with any baked good that pairs berries and lemons. These cookies look wonderful!